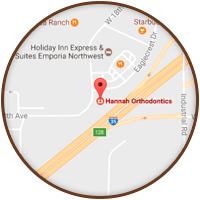 Here’s what patients are saying about Hannah Orthodontics! If you’d like to share some kind words and smiles, please ask our front desk staff for a comment card at your next appointment. We’d love to hear about your experience! We appreciate the kind words, Mariah! I love the atmosphere when I walk in the building. Everyone is so friendly yet they keep a professional aspect as well. 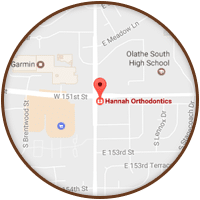 If anyone is looking for an orthodontist then I would definitely recommend Hannah Orthodontics! Dr. Hannah and team continue to impress me! From check-in to check-out - I have been impressed in every single visit with how smoothly this operation runs! One time we were there early to hear the pre-opening meeting that the employees have before patients come in. To hear how they plan ahead, discussing who would be coming in that day, and any special attention certain patients might need was so cool! Also, seeing what a special day they create for patients who get their braces off was really neat! This is a first class practice - and I'd recommend anyone to Dr. Hannah's office! Everyone at Hannah Orthodontics is always so pleasant and helpful. Dr. Hannah is such a professional and a gentleman as well. He always speaks to me on a personal level and makes conversation with my mom. He always explains everything going on with my teeth and makes sure we know what is happening and what the plan is. He makes sure we are OK with the treatment plan as it progresses. I am having trouble getting some molars to come in properly, but he doesn't give up and say my teeth are adequate the way they are. He wants perfection and so does my parents. All the staff members are really great, as well. They make me feel welcome and cared for. 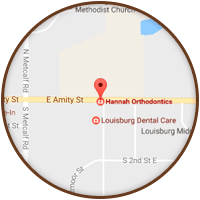 Every time you step into Dr. Hannah's office you know you are going to get a smile from everyone there and the whole staff goes out of their way to make you feel comfortable. Dr. Hannah is so kind and calm with the kids and makes sure they understand everything that is going on. He also takes the extra time to get to know them and ask how things are going for them in school, sports, etc. My daughter recently received her braces and Dr. Hannah called her a couple of days later to check on her to make sure she was doing okay. It is not often that kids enjoy or look forward to going to the orthodontist...my kids do! Thank you! I think the entire staff at Dr. Hannah's office is top notch. Everyone is friendly and smiling and ready to do their job. Dr. Hannah is patient and kind and always makes sure he talks to my kids and asks them about their day and what they are involved in. He makes sure it's all about them which is how it should be! 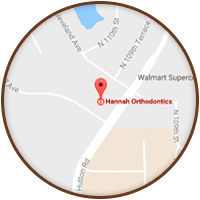 I would highly recommend Hannah Orthodontics to anyone interested in getting braces whether they are children, teens or adults. From your first time in the office where they explain the treatment process to every appointment following, they are all super friendly and greet you with a warm smile and hello. They make you feel like it's one big family. Dr. Hannah makes sure you are happy with the way things are progressing and if something isn't moving quite like they wanted, they will try another approach all while making sure you are comfortable with everything. I would definitely recommend them to anyone wanting or needing to get braces. 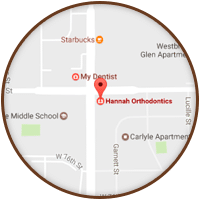 From the start of our 'braces adventure' to now - about halfway through - our experience with Dr. Hannah and his staff has been exceptional. We started out with the usual fears and concerns of putting our son in braces - his comfort, the financing of the treatment, the longevity of the process - and every step of the way we have been comforted by this groups professionalism and clear ability to provide orthodontic care with excellence. Friendly, kind and funny - highly recommend them to anyone! I LOVE THIS OFFICE! The staff at this office are such wonderful people. We were referred here by a friend of mine and I've never been unhappy about anything. My daughter is a special needs child and for her to have people that are understanding, patient and caring means the world to us and that is what you'll find at this office.